AVON – Keri Hays has always been creative, looking for ways to express herself through art. She is inspired by an admiration of the feminine form and a passion for nature. Hays will display her art at the Westin Riverfront Resort Saturday afternoon from 4 to 10 p.m.
A Colorado native, Hays has lived in the Vail Valley for eight years and has developed her artistic skills completely on her own. Nature plays an essential part in the dimensional art she creates with vibrant colors and organic shapes and forms. 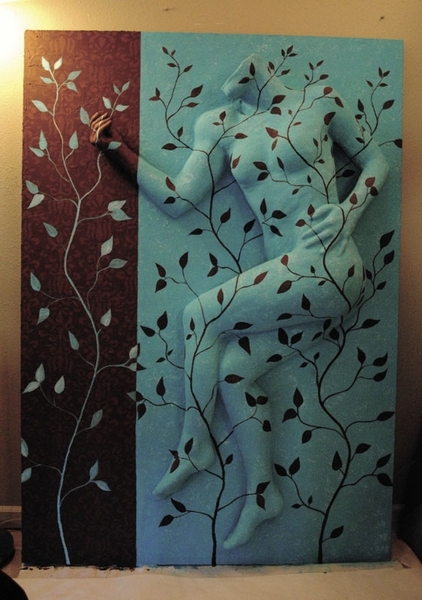 Her favorite mediums include plaster, gauze, plywood, texture and acrylic paint. “I am thankful to be able to capture the beauty I see surrounding me, and to transform the shapes and colors into a lasting impression,” said Hays.